Young Tiger Jr NTR is actively seen involving in the wedding festivities of the director SS Rajamouli’s son Karthikeya. The wedding is said to be a grand affair and many celebrities have made their presence at the event. The sangeeth, mehendi and the wedding events turned out in a colourful manner with the presence of all top Telugu celebrities. 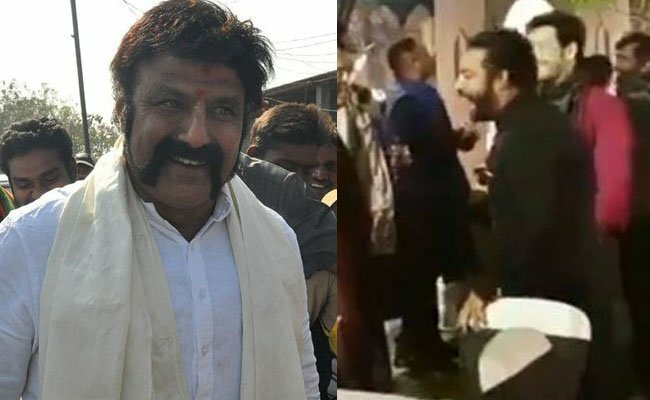 Meanwhile, a video of Jr NTR is currently trending viral on the social media in which Jr NTR is seen chanting JAI BALAYYA. It was great to see for all the Nandamuri fans as they never expected Tarak to be chanting his Babai’s name just like a fan. We can see Jagapathi Babu and Akhil Akkineni in the video and they were surprised at the josh that Jr NTR exhibited.